Ready to take your career to the next level? 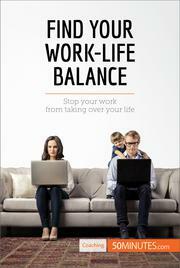 Find out everything you need to know about work-life balance with this practical guide. With the growth of technology and increasing expectations at work, it can be difficult to draw a distinct line between your personal life and your life at the office, leading to increased stress and difficulty coping. This helpful guide will give you all the advice you need to rediscover balance, enabling you to be a more efficient employee at the office and a more relaxed person at home! The Coaching series from the 50Minutes collection is aimed at all those who, at any stage in their careers, are looking to acquire personal or professional skills, adapt to new situations or simply re-evaluate their work-life balance. The concise and effective style of our guides enables you to gain an in-depth understanding of a broad range of concepts, combining theory, constructive examples and practical exercises to enhance your learning.